There is much talk about the German ‘Training Scale’ in the context of horse training and in many a barns – especially with dressage focus – we’ll find posters, images or signs on the walls, showing the 6 elements of the training scale or training pyramid. ”. At the same time, Siegfried von Haugk – cavalry officer, head of the remount school Oschatz and co-author of the HDV12 – created an updated version of the army hand book on “Teaching Riding to Recruits”, which contained – for the first time – the description of the 6-step systematic training system in sequence as we know it today. The HDV12 is – essentially – the basis for today’s FN Principles of Riding. The ‘principles’ were altered, however, to meet the needs of today’s recreational riders. 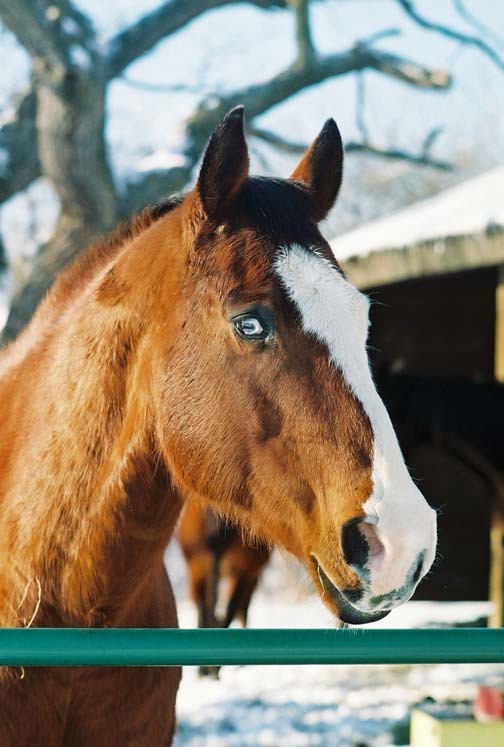 In recent years, the panel responsible for the content of these principles has decided on a return to some of the original teachings of the HDV12 to ensure horse welfare.
) as well as in the HDV12. But are there preconditions for even getting to suppleness? Is there a step before the step? This ‘path’ never ends! It must be introduced before Suppleness can be expected. However, it is not a ‘step’ that we accomplish and then move on. We need to actively and consciously incorporate these three important ‘paths’ into our schooling – and the learning as well as the rewards will never stop. 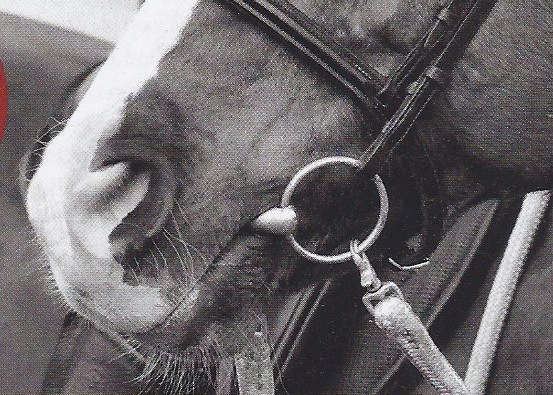 This horse is bracing in the head-neck junction and the upper neck. The goal: Identify those factors that cause bracing in your horse. Caution: This is not a ‘one fits all’ process, but a very individualized look at what your horse is expressing and an investigation into possible causes. Then eliminate these factors and replace with something that works for horse and rider, but allows the horse to move freely. Note: Bracing is not always bad… When catching a basketball, you brace against the impact. The key is to be able to let go afterwards! Constant, habitual bracing is the problem. 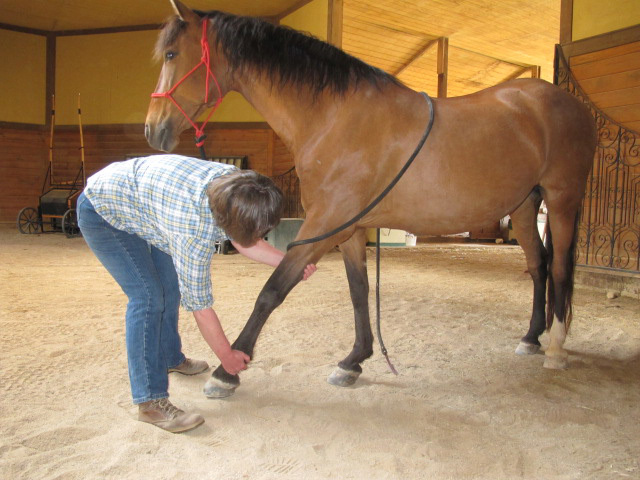 A simple Masterson Method exercise to release tension in the hind end. The goal: Find areas where tension & restriction resides and release it through various modalities, enabling the body to find a whole new way of moving in a relaxed way. You are strolling down a busy street on a sunny Saturday afternoon – leisurely shopping pleasure. Suddenly, you hear a loud crash only a few yards away. A car accident! How does your body feel? Without any of your conscious doing, your body will show the typical human stress response posture: tucked in chest and abdominals, shoulders rounded forward, knees slightly bent, head moves forward (basically our modern ‘smart phone’ posture…) – and increased blood sugar and blood pressure, heart rate and sweating. This rehab horse had a tense facial expression upon arrival. The key to avoiding these physical stress responses is to eliminate stress. Easier said than done! Are you causing your horse stress? You may not think so. But once you experience truly non-confrontational dialog with your horse, you will see a difference. The goal: Creating a relaxed mental platform on which horse and rider and interact productively without the barriers of stress response, which always leads to physical tension. Got it? Got A-B-C covered? Then off you go, enjoy your success with Suppling Exercises! If you have questions or would like to dive into these topics a little deeper, I recommend my seminar “Path to Performance™ I – Releasing Tension & Restriction”. As always – be well and enjoy your horse! – will often be the key to resolving the hidden causes of girthy behavior. Battling the horse for any reason is never a good idea. Even if we manage to muscle our way to goal achievement, both horse and human are left with a bad taste in their mouth, wormer or not. Any interaction between horse and human should be one of mutual understanding and cooperation, whenever possible. and other similarly ineffective or drama-soaked techniques. But what to do? The endurance riders among you probably already do it: You need to give your horse electrolytes during rides and probably practiced that with well-tasting syringe contents first. The trick is: Get your horse to happily accept syringes before approaching with the ill-tasting stuff! An empty syringe and some apple sauce. 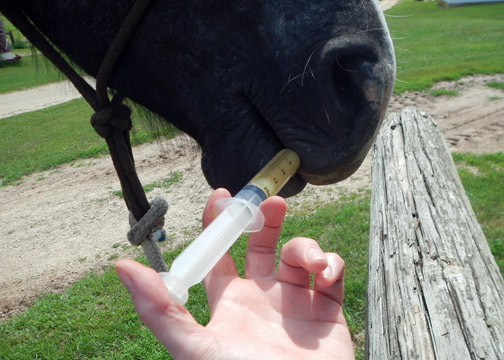 Every time you see your horse, find an opportunity to fill a syringe with apple sauce and gently move your hand with the syringe around the horse’s mouth. 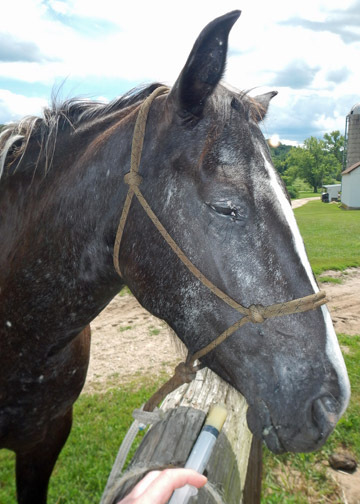 In the beginning, your horse may react unfavorably, thinking you are approaching with the wormer. 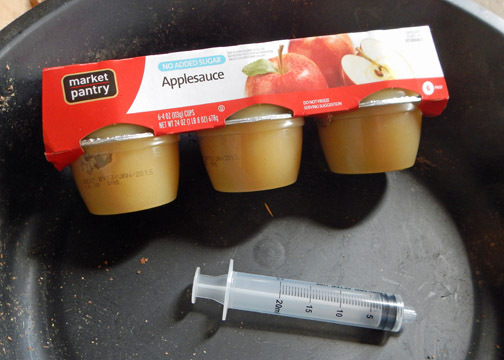 Fill the syringe with apple sauce—several times, if needed. Don’t insist that your horse look at the syringe, simply make it available around the horse’s head. Curiosity will eventually lead the horse to take a sniff and let you touch his lips with the syringe. While your goal is to eventually be able to squirt the contents into your horse’s mouth, take your time and plan for several sessions. For day 1, a soft eye around the syringe is a good goal. Don’t ‘push’ the syringe on the horse. Hold it near the horse’s mouth and let it be the horse’s idea to approach it. Be satisfied with small progress. A soft eye, not moving away from the syringe, may be a good goal for the first day. Don’t have an agenda. Your horse will tell you when he is ready to give this a try. Let the horse think that it is his idea to take the syringe into his mouth. From then on, it’s smooth sailing! 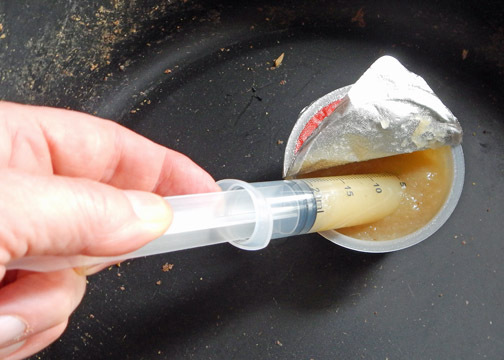 There will be some disappointment after the first time the syringe does not contain apple sauce, but you can remedy this by squirting apple sauce into the horse’s mouth right after the wormer. He’ll take his chances with you again. Let me know how this worked for you and leave a comment! Let it be the horse’s idea! In the last two parts of “The Horse’s Back”, we talked about how to recognize that your horse may be experiencing back problems and what are some of the reasons that a horse may get a sore back. So you now already know some of the symptoms and causes for back pain in horses. Today, let’s look at some no-fail/no-harm steps you can take to help your horse recover from back soreness or maintain a healthy, strong and pain free back. First, before we get into hands-on bodywork or gymnasticizing for horses, we will want to remind ourselves that we need to eliminate any external factors identified in part 2 of this article series. Among those were saddle fit and rider influence. Again, investigate thoroughly, then eliminate these external factors before moving on to help the horse overcome his back soreness. We also touched on internal factors, such as pain/discomfort/restriction in other areas of the horse’s body. Another possible underlying cause for back soreness can be any type of hind end lameness, such as stifle problems or arthritic hocks. Discuss this possibility with your vet and take any steps your vet may recommend before addressing your horse’s back discomfort. Fear, worry, and anxiety—another big contributor to tightness and pain in the horse’s back—should also be identified and alleviated. Examples are an overly assertive pasture mate, ‘heavy metal’ music blaring from the barn workers radio or an irregular feeding schedule. I mention this as the first item, since I find it most important. Whatever else you may want to do with your horse—hopefully plenty of beneficial exercising and possibly some changes to tack, etc.—releasing tension is the precondition for building muscle in the right places. The long back muscle is an important player in your horse’s movement. He uses these muscles with every step. If they are permanently contracted and cannot release, your horse’s movement will be restricted and the back will be sore. Release tension and stimulate blood flow in these muscles with a simple exercise, no massage skills required: Take a normal tennis ball and roll it around on your horse’s long back muscle all over the saddle area. Do this before you ride. Pay close attention to your horse’s reactions and be sure it feels good to the horse. Stay off any bony areas (shoulder blade, withers, spine) and concentrate on the muscle (see image). Stop at the last rib. This exercise is well known but many people don’t bother with it. But it is indeed a very effective exercise. When it comes to horses, I found that most things that are very beneficial are simple, not rocket science… This exercise creates motion in the most flexible junction in your horse’s back: The sacrolumbar junction. This is the only spot in your horse’s back that is really flexible. All other parts of the back are relatively rigid. For this exercise, you will need to use quite a bit of pressure with some horses: Stand behind the horse and find a point midway between the point of hip and the sacrum that is relatively sensitive to the touch. Use your thumbs to initiate a movement reflex in the horse by pushing down firmly, then pulling your thumbs down toward the poverty groove on both sides. Ideally, your horse should now lift his back, tuck in his abdomen and tilt his pelvis (as in a ‘sit-up’). If your horse is not that sensitive, use two quarter coins instead of your thumbs. Caution: Be safe behind the horse! Don’t do this exercise more than 3 x per session and no more than 3 x per week. This is a reflex point and will numb if overdone. Yes, horse people pull on their horse’s tails all the time, with mixed results ;-). This exercise is a bit different, in that you will want to actively engage the horse in this exercise and make him use his abdominal muscles. Here is how to do this with your horse: Stand behind your horse and hold on firmly but carefully to his tail with both hands. Then pull back (you can even lean back a bit) until you find a point of resistance and the horse actively resists the pull, meaning you cannot pull him back any further, he is leaning forward. Then SUDDENLY let go. It’s important to do this quickly! Observe your horse’s abdominal muscles and area around the sacrum when you do this. He should quickly engage his abdominals and tuck in his pelvis just a tad. You will also see muscles around the sacrum engage when he recovers his balance. Do this two or three times before riding. Exercise 4—The good old carrot stretch! Active carrot stretches are great for the horse since he determines the amount of stretch and you cannot do anything wrong. 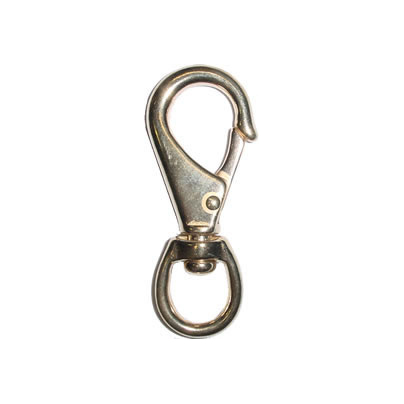 They are fun and will make you really popular with your horse since he will anticipate the treat. Folks who don’t like to feed treats, don’t worry! You are feeding the treat within the framework of a predictable exercise. The horse will quickly learn that this is the only time he gets treats. For carrot stretch instructions see my previous article on carrot stretches with horses. When you google ‘gymnasticizing’, you will see that the word mainly pops up in the context of dressage training. However, we don’t all ride dressage. Do we still need to ‘gymnasticize’ our horse? And what does it mean? The answer is YES, we all need to gymnasticize our horses, no matter what type of activity we engage in with our animal. The reason: We are asking him to perform unnatural things like carrying a rider or pulling a cart. So what does gymnasticizing mean? It simply means to build maintain the horse’s muscles and self-carriage to an extent that will allow him to stay SOUND and well while performing the activities we ask of him.Since ALL of the horses back muscles are locomotion muscles…(!!! ), it is important to ensure that they can release and contract. 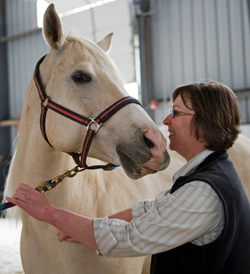 This can be achieved by regular targeted exercise, targeted to the needs of your horse. Sounds complicated, but it’s not at all. For most recreational riders, the effort will be rather small. If you horse is an active athlete and you compete, you will need to think about gymnasticizing a bit more than the average rider. Longing is not simply mindless running about on a circle or tiring your horse to let off ‘steam’. It can be a very meaningful way to gymnasticize your horse. ” and glean some tips and try some techniques. If it gets overwhelming, stick to some basic longing techniques. Stay away from auxiliary reins! They can be necessary in special cases, but generally cause more harm than good. How much? 3 x 20 minutes per week can work wonders. or a DVD or even VHS (you can find good deals on ebay). Last not least: A good hack!!! I will call the outdoor activity or hitting a trail with your horse ‘hacking out’ here, versus ‘trail riding’. The reason: Trail riding is often understood to be a leisurely activity, spending time with your horse and fellow riders in the great outdoors and….mostly keeping the horse at a walk. This is counterproductive for what we’d like to do: strengthen the horse’s back. Your horse’s back will be strengthened by a nice, fresh tempo on the trail. A forward walk, then a bit of brisk trotting, a nice walk, followed by a brief canter, etc. Tackling hills and slopes at various gaits will also help your horse. Important: Post the trot and be in a two-point in the canter! Enable your horse to move freely and stay within his limits. A tired, sweaty horse or a horse that ties up after exercise is NOT what we are after. It’s better to ride for 2 hours at a doable pace than race about the park for an hour! Give your horse at least 15 minutes of brisk walk at the start of your ride to warm up before you start picking up the pace. What are the causes for back problems in horses? You can apply a few simple techniques to make great strides in getting your horse’s back into shape. I hope that these pointers inspire you to get on the path to your horse’s wellness and enable your horse to perform at his personal best. If you read The Horse’s Back (part 1) “How to detect back problems in your horse”, you already know whether you suspect your horse to suffer from discomfort in the back. And you already know that symptoms may be anything from an unwillingness/inability to step under to bucking and rearing, in extreme cases. So now that you know how to spot some back issues, you will want to know what to do about them. We could now get into gymnasticizing, horse massage, equine bodywork, liniments, supplements, Jägermeister or Guinness in horse feed (;-)… But whoa! First let’s look at possible causes. Only if we identify possible causes will we be able to address them effectively—not just tinker around with the symptoms. 1) How does the saddle fit the horse? 2) How does the saddle fit the rider? If the saddle fits your horse but not you, you will be unbalanced in the saddle, which is just as uncomfortable to the horse as an ill-fitting saddle. A saddle that is comfortable for you but doesn’t fit the horse is a torture instrument for the horse. Tree size, length, ‘rock’, balance, rigging, all these are elements that need to be considered in Western and English saddles. Looks nice, but doesn't fit. This saddle bridges and slides back under the rider. A torture instrument for the horse. You say: “No problem, my horse’s saddle does not have a tree!” Please recheck the fit: Treeless saddles are the perfect solution for some breeds or horse/rider combinations, but NOT for all. Too long – Hea ye, hear ye! This is THE main cause of saddle related back problems I see in my practice. The weight bearing area of the horse’s back ENDS with the last rib. Anything beyond that causes a myriad of problems RESULT: not stepping under, tightness in lumbar, not taking left/ride canter leads, hops during transitions, goes against the bit, grinds teeth, sweats quickly under the rider but not on the lunge line…. The list goes on. Not enough rock – saddle is too straight and ‘bridges’. This is a problem often found in modern Western saddles. 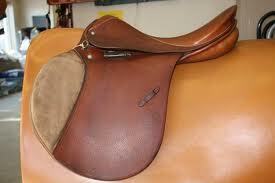 Not sure, who designs these saddles, but a horse’s back is NOT straight like a workbench. The result is pressure in the front of the saddle and in the back, with no or insufficient contact in the middle. RESULT: hollows back, lifts head, rushes, bucks or in more agreeable types: gets lazy or collapses. Main cause of ‘cold back’. A very important, often overlooked element. Here, you will need to differentiate between English and Western saddles and the respective various types (dressage or jumping, reining or trail, for example). This discussion would go too far here, please see this article for resources. If you feel this is an old hat and you got it all covered, please make sure that this is really the case. Regrettably, we sometimes get advice from ‘subject matter experts’ that steer us in the wrong direction, even those that are certified and especially those, who’d like to sell us a saddle. I would like to encourage you to do your own research. 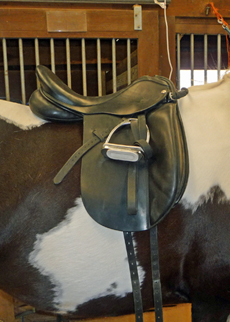 Article: “How saddle fit contributes to your horse’s soundness”. This article contains a number of videos about English saddle fit, presented by Jochen Schleese. These contain good basic information about saddle fit and are not a sales pitch, worth watching. In this article, you will also find some links to recommended books and videos. Here a word about “Mismatched” equipment: The horse does not care whether you ride in a brown bridle and a black saddle. But he does care whether you want to ride dressage in a jumping saddle, for instance, or do endurance in a dressage saddle. Your saddle has to fit the purpose. One example I encounter frequently: A rider has a multi-purpose saddle with focus on jumping, such as the good old Stubben Siegfried VSS I learned to ride on. This saddle is ideal for jumping, hacking out, hunting, rising trot and two-point seat. This is an excellent saddle if you… hack out a lot in the two-point seat, hunt, jump, if you post the trot and ride the canter in two-point. This saddle is NOT suitable for dressage or for any rider, who would like to actually sit in the saddle most of the time. It is not designed to distribute the weight accordingly and will make your horse’s back hurt, if you use it as it was not intended. Please take your time to research this further by means of the resources mentioned in my article above. Yes, this is a touchy topic. Imbalance, heavy hands, hollowed backs, bracing, using stirrups incorrectly, using the dressage whip incorrectly (giving impulses at the wrong time), sitting heavy during the down-phase of the rising trot, imbalances in the rider’s anatomy, an unfit or overweight rider, all can contribute to a horse’s back discomfort. Rider fitness, confidence, riding technique and balance are important factors that all influence the horse’s back health. It is hard to take a good look at yourself. I know that from experience. However, you will reap the rewards if you do and so will your horse. Identify your goal, whether it’s getting in shape, overcoming some confidence challenges, losing a few pounds or brushing up on your riding skill and find a knowledgeable coach to take you to the next level. We all have movement habits, and so do our horses. Your horse may have learned a certain inefficient self-carriage at some point in his life, either during early training or being ridden by a former owner, as a result of an old injury or a formerly ill-fitting saddle etc. This movement habit now needs to be identified and then actively ‘unlearned’ or rather replaced with a better, more efficient and more comfortable self-carriage. Recognizing a movement habit is a bit tricky. This involved a few steps from ruling out all other possible causes to seeing the horse is motion and under saddle. Postural re-education is a process that takes patience and knowledge and should be done with the help of a skilled equine professional or trainer. 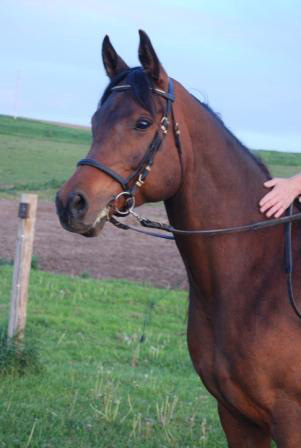 Conformation – not all horses are created equal! And the ‘Fear Factors’ – pain, worry, anxiety manifest as back problems. Until next time, when we will take a look at “How to help your horse overcome back problems”. In order to detect back problems, we need to pay close attention to our horse. what to do about it (once the vet determines there is no underlying medical issue!). stomp his foot, pin his ears, jerk up the head, swish his tail, hollow the back, kick or bite when you are grooming the back or saddling? let his back ‘sag’ (think hammock) or tense his back during leading, lunging or riding? have sticky, choppy, disharmonious (different lengths of strides, out of rhythm) movement when ridden? rush when ridden, is extremely hasty, runs away when ridden? lack impulsion, not step under? not sufficiently accept the rider’s aids, especially the driving aids? lack fluidity or suddenly and unexpectedly blocks the rider’s aids? has a tendency to carry his head high when ridden? grind his teeth, shake or jerk his head, tilt in the poll when ridden? unexplained recurring lameness not traceable to issues in the legs? Is your horse restless when being mounted or does he bite, kick or (in extreme cases) throw himself on the floor or run off? Do your horse’s back muscles feel hard and/or cold to the touch, is there a pronounced dip behind the withers/shoulderblades? Do your horse’s back muscles flinch as you lift the saddle towards the back? a considerable amount of discomfort for the horse. “My horse is just ‘cold backed’…”, some horse-owners tell me. Being cold-backed (being especially sensitive when first saddled and ridden, possibly bucking, needing to be ‘warmed up’ for a considerable time) is not an innate quality of a horse, like having a white sock on the left hind. It’s a man-made problem, needs to be taken seriously and remedied thoroughly. The remedy for back problems in any horse depends on the underlying root cause. This needs to be thoroughly analyzed and many factors come into play. In our part 2 of this article series, we will take a closer look at “What are the causes of back problems in horses?”. Until then, I will be happy to respond to any questions. Just drop me a line (email: info@reinholdshorsewellness.com)!